This is simple knife with a simple design and a simple mindset. It is durable beyond compare and versatile due to its simplicity. It is ruggedly built with no single purpose in mind so it is well equipped to handle most anything. It's thickness does get in the way, however. The very thing that makes it so durable is what limits some aspects of its versatility. The Overlander 2 is the revised version of the original Overlander. They have thinned out the handle which makes it very comfortable and given it a new look with different colored micarta and blade coating. 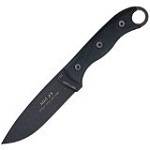 This is a very robust little knife, if you are looking for a smaller fixed blade that has can handle a lot of abuse then this is the knife for you. It is thick and has a saber grind which does not make it an amazing slicer, but it will preform well in all the task you would ask it to do.